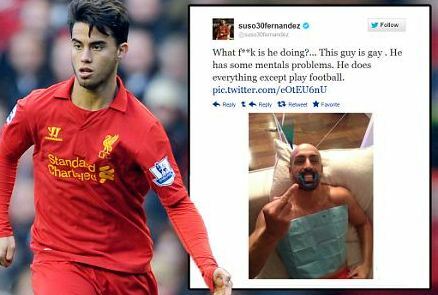 Spanish youngster Suso has been fined £10,000 by the Football Association for calling Liverpool team mate Jose Enrique gay on twitter. The 19 year old ( Twitter handle @suso30fernandez) made the seemingly innocuous remark as a reply to a photo of Enrique showing himself whitening his teeth ( Full comment below) and was immediately attacked by other users on the social networking website. After the backlash, the Spanish U-19 international apologised for the tweet, saying that he hadn’t meant for it to be interpreted in a negative sense and it was just a joke. However the FA has now gone a step ahead and fined him £10,000. Enrique himself expressed disbelief at the fine, saying that it was only a “bit of banter” between two teammates. Did Suso’s “homophic jibe” warrant a fine?